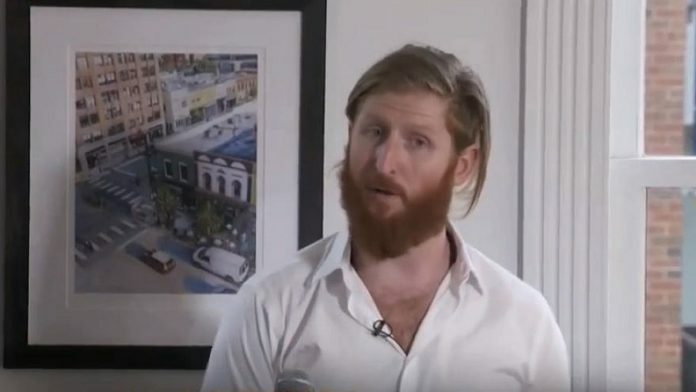 John Cheney-Lippold, an associate professor in the American Culture department at the University of Michigan, cited the BDS movement in his decision to withhold a letter recommendation for a Jewish student seeking to study abroad in Israel. Credit: Screenshot. The development comes amid two anti-Israel controversies at the university, including another professor denying a letter of recommendation to study in Israel and a photo used during a lecture comparing Israeli Prime Minister Benjamin Netanyahu to Adolf Hitler. (October 10, 2018 / JNS) A University of Michigan professor, citing his support for the BDS movement in denying a student’s request in August for a letter of recommendation for a semester-long study-abroad program at Tel Aviv University, was sanctioned on Tuesday by the university. The punishments against Cheney-Lippold include a stern warning, ineligibility for a merit increase for the 2018-19 academic year, in addition to being ineligible to take an accredited sabbatical until the fall 2020 semester. Ingber’s family found out about the course of action through a Freedom of Information Act request, obtained by JNS. Cheney-Lippold met with Elizabeth Cole, interim dean of the College of Literature, Science and the Arts, on Sept. 20, where he acknowledged he was wrong regarding university policies on the BDS movement and instead inserted “a personal stance,” according to a letter from Cole to the professor, which is part of the FOIA file. Despite a BDS resolution passed last year by the university’s student government, the school itself prohibits its departments or any part of the university to boycott or divest from Israel. This development comes amid two anti-Israel controversies at the university late last week: a guest lecture comparing Israeli Prime Minister Benjamin Netanyahu to Adolf Hitler and a graduate instructor denying a similar request from a student, citing the same reason as Cheney-Lippold.